Another striking aspect of this graph is that, whereas most non-Eastern regions experienced increases in the number of total votes (and a somewhat smaller increase in AKP votes), the experience in the East was quite different. Here, the number of votes either declined overall or were marginal in comparison to the added votes for the AKP. Thus, AKP’s proposed constitutional amendments gained additional votes in a region where the number of total votes declined. Within the Eastern regions, in the right-hand graph, Diyarbakir and Sanliurfa added the largest amounts of new votes for the AKP, followed by Van and Mardin. This by itself is unsurprising, as these are also (bar Gaziantep) the most populous provinces in the region. Yet even if one further includes Gaziantep, these account for just over half of all added AKP votes from the East. The rest is from the more peripheral provinces, like Sirnak, Agri, Hakkari etc. A number of factors have been brought forth to try to explain this. This could also have implications for the practice of “block voting” , where local elites determine how their constituency votes. The fighting has further resulted in extensive internal displacement of large numbers of voters following heavy fighting and the destruction of significant parts of cities like Sur in Diyarbakir, Nusaybin, Yuksekova and Cizre, resulting in dislocation of “people who used to provide 90% of the HDP votes in those cities”. It is also possible that some voter segments who might not normally vote for either the AKP or the HDP, such as the Huda-Par movement, voted for the AKP(‘s proposals) in this election. First of all, it is clear that the voting dynamics of the East are very different from that in the rest of the country. 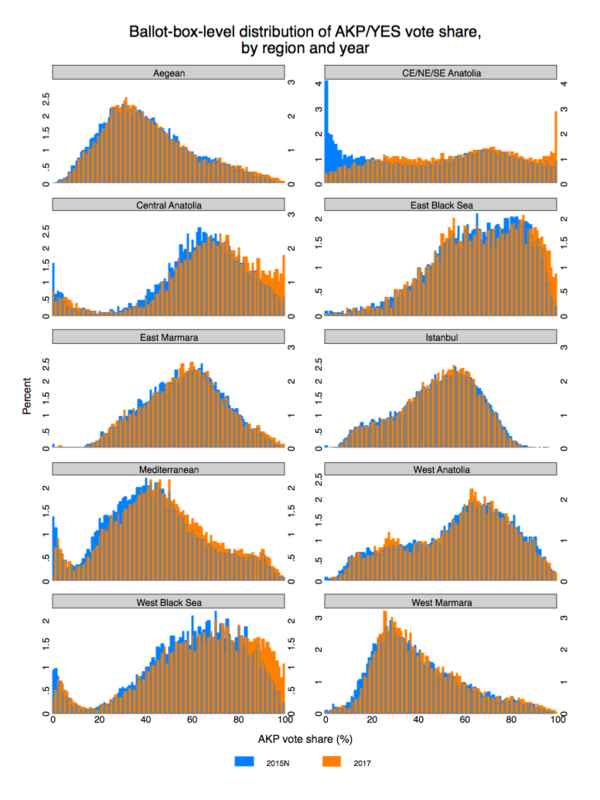 Similar to my previous post, the below graph plot histograms of the YES share vote distribution in 2017 against the AKP vote share distribution in November 2015, all at the ballot box level. Whereas in the part of Turkey outside the (C/N/S) Eastern Anatolia region the rightwards push in the mass appears to be rather smooth, in the East the main changes have occurred at the edges of the distribution. The prevalence of the Never-AKPers, who vote close-to or never for the AKP, that have existed going back at least the last four elections, have disappeared and have instead been replaced by a significant share of Always-AKPers, who tend to vote homogeneously for the AKP. 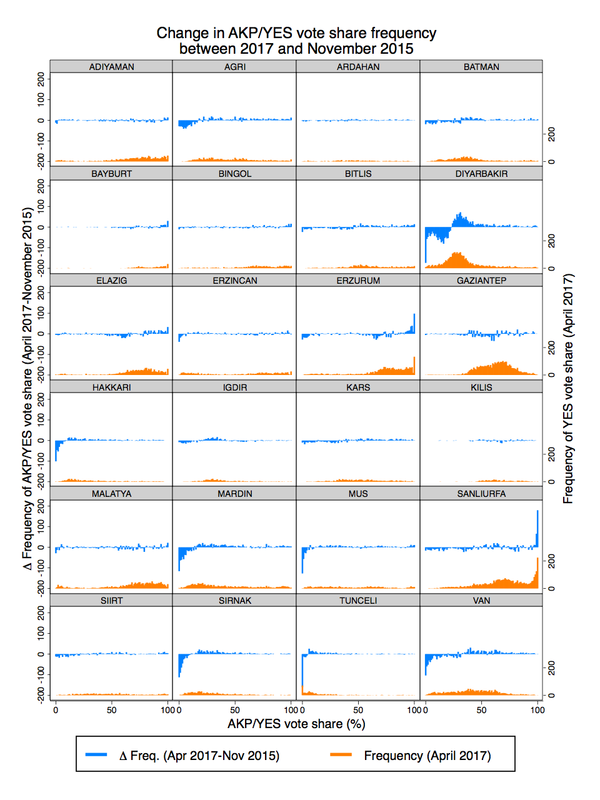 Yet, as the below graph shows this doesn’t seem to be block votes moving from one edge of the distribution to the other, as the disappearance of the Never-AKPers (Diyarbakir, Hakkari, Mardin, Mus, Sirnak, Tunceli, Van, Sirnak, and Van) is observed in different provinces than where the appearance of the Always-AKPers occur (Erzurum and Sanliurfa). This graph shows the difference in the frequency of the YES vote share in the referendum and the AKP vote share in November 2015. At the bottom of each panel, with a compressed scale, is the frequency of the 2017 YES vote share. As for the Always-AKPers, in Sanliurfa this could potentially have to do with increases in security forces there. But has there been similar increases in security forces in Erzurum too? (Not to my knowledge). Also, it is likely that security forces have become more prevalent in the other southeastern provinces too, but this phenomenon does not show up there. In particularly Sanliurfa, the magnitude of these Always-AKPers is large. Boxes with between 99-100 % or more voting for the AKP increased by 246 boxes, and given the province’s average number of valid votes of 253 per box, this translates into 62,238 votes, or roughly 77 percent of the added votes the AKP gained compared to the previous election (80,453) in the province. In Erzurum, there were 98 more ballot boxes (compared to the previous election) with more than 99% AKP votes. Given an average number of valid votes per box of 192.7, this implies 18,885 votes affected, roughly 75% of the votes the AKP gained compared to the previous election (25,232 added votes). The disappearance of the Never-AKPers affects a larger area in the East. 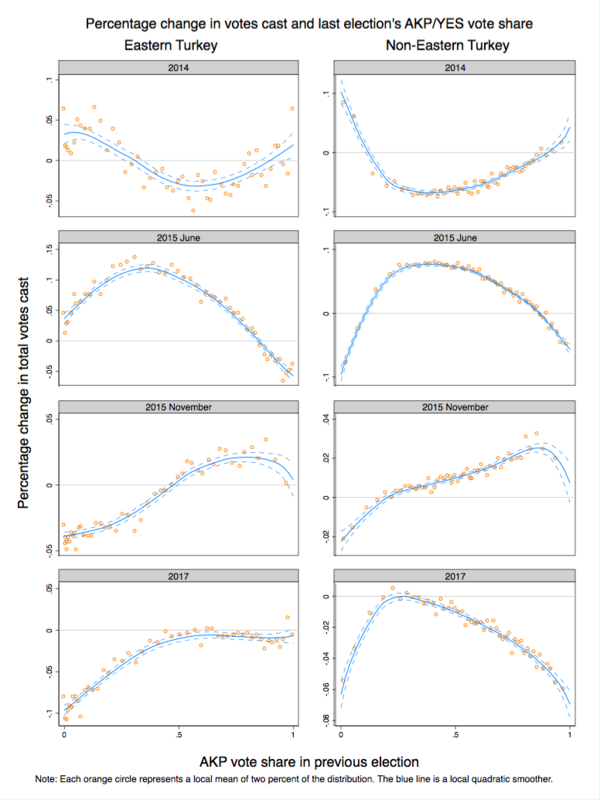 The change in frequency for the previously mentioned provinces (Diyarbakir, Hakkari, Mardin, Mus, Sirnak, Tunceli, Van, Sirnak, and Van) with sharp drops in frequency for the 0-1% bin AKP vote share was 896 ballot boxes, and given an average votes per box of 212, this affects roughly 189,952 voters, or around 72% of the additional votes AKP gained (264,064) compared to the last election in these provinces. One thing should be clear at this point: whatever factor is driving the Never-AKPers and the Always-AKPers, they have a significant bearing on the magnitude of the change in AKP/YES votes between the current and previous election. Is the Disappearance of Never-AKPers driven by Conflict-Driven Displacement? Whereas I have a hard time explaining the appearance of the Always-AKPers in two provinces, the broader disappearances of the Never-AKPers may have something to do with the conflict between the Turkish state and the PKK, particularly with regards to the significant internal displacement that has followed as a result. It is arguably safe to assume that the neighborhoods in Eastern Turkey least likely to vote for the AKP are also those that have experienced the highest conflict intensity so far. For example, it should come as no surprise that most neighborhoods in Nusaybin and Cizre — where whole quarters of the cities have been razed — have tended to vote almost exclusively for the pro-Kurdish HDP (in November 2015 the vote shares were circa 9 and 5 % respectively). Consequently, is there a link between initial political preferences (which are also the places that and change in voter turnout? 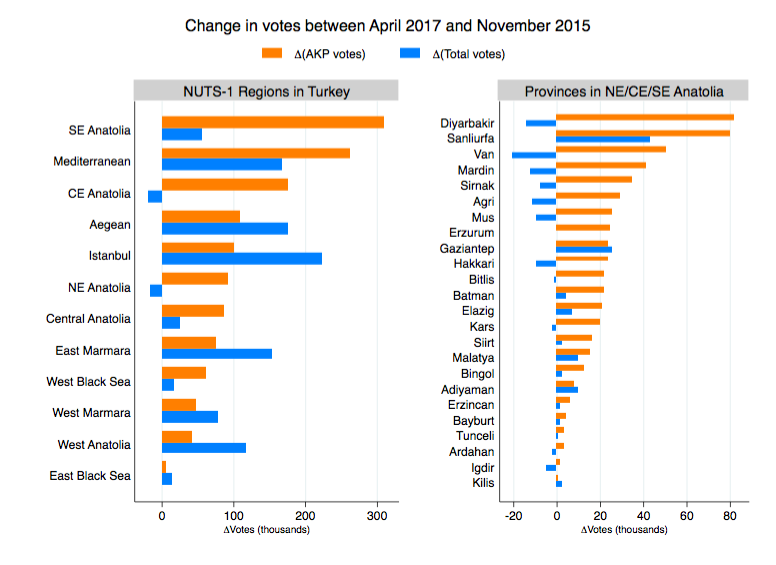 The relationship between the AKP vote share in the past election and the percentage change in total votes cast (between current and past election) was roughly similar in the East and non-East up until 2017. In 2017, the relationship looks quite different comparing the two regions. For the non-East, except for the bottom three percentiles (orange circles) of the AKP vote share, the relationship is roughly linear and negative. Yet in the East, it’s positive at lower levels of the previous election’s AKP vote share and flat at higher levels. Whereas, in the non-Eastern part of Turkey, higher initial-AKP-support areas saw larger turnout declines, in the Eastern part the lower initial-AKP-support areas saw larger declines, but only for neighborhoods where the AKP was getting a minority share of the vote. This non-linearity in the relationship in the East suggests there is some process that affected the low-AKP-voting areas in the East to a greater extent than higher-AKP-voting areas in that same region. Many of the neighborhoods with both the lowest initial AKP support as well as the largest turnout declines appear to be among those who have also experienced large-scale fatalities, crippling 24-hour curfews, as well as material destruction of the urban space. The disappearance of the Never-AKPers, and the increase in the number of AKP votes in this area, thus appears intimately linked to the forces that drove people out of their homes, or whatever was left of them. The extent to which this is driven by forced out-migration, or the risk of future out-migration, is however beyond the scope of this post.